Bill Pritchard is probably best known for being jailed under a bogus conspiracy charge in the aftermath of the Winnipeg General Strike. He was also a militant of the Socialist Party of Canada, the editor of its newspaper, The Western Clarion, and a founder of the One Big Union. After the demise of the SPC, he was an early member of the CCF and was Reeve of Burnaby for a number of years. Later in life, he returned to the "Impossibilist" socialism of his roots. 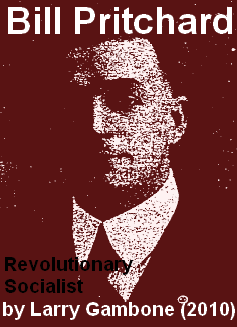 "Bill Pritchard - Revolutionary Socialist" - was taken from a talk he gave in 1973. It describes his adventures - and often hilarious misadventures - as a pioneer Socialist on speaking tours of Western Canada more than 90 years ago. He reminisces about a host of fascinating characters and also gives crucial eye-witness evidence about the murder of Ginger Goodwin. Bill Pritchard is probably best known for being jailed under a bogus conspiracy charge in the aftermath of the Winnipeg General Strike. He was also a militant of the Socialist Party of Canada, the editor of its newspaper, The Western Clarion, and a founder of the One Big Union.